At our fifth annual Strengthening Democracy Awards on April 12, we were reminded of the power ordinary Nebraskans hold. Help us continue our mission of ensuring the benefits of democracy for all in the Cornhusker State. If you’re a supporter of Civic Nebraska, you know we often stress that a modern and robust democracy doesn’t build itself – it takes the hard work and vigilance of dedicated citizens so we may all benefit. And since our origin a decade ago, we’ve envisioned a community in which Nebraskans of all ages and backgrounds join to take action in innovative ways. At our fifth annual Strengthening Democracy Awards on April 12, we were reminded of the power ordinary Nebraskans hold. A full house at Chez Hay in Lincoln learned about teachers bringing civic action and service to their daily lessons; how community partners have a profound impact on civic society across the state; why advocates of civil discourse and civic action build new ways to educate and inform. We honored those whose quiet work enables game-changing programs to take root; student leaders who inspire; and the commitment to safeguard everyone’s access to the ballot. Pulitzer Prize winner Matt Waite delivers the Strengthening Democracy keynote. 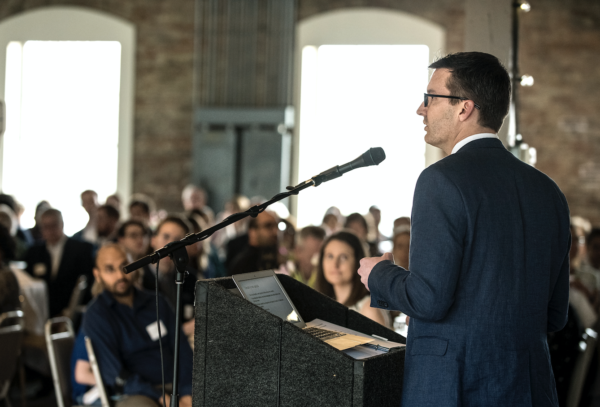 We heard keynote speaker Matt Waite’s call for everyone to take greater ownership in our local media, to fully engage with the press in its democratic role, and to continue pushing for local news organizations to truly reflect the communities they cover. If you care about civic education and an engaged, informed citizenry, give to Civic Nebraska. If you care about voting rights and making access to the ballot easier for all, give to Civic Nebraska. If you care about media literacy, and how to distinguish credible news from fake news, give to Civic Nebraska. If you believe in a modern, robust democracy, please give to Civic Nebraska.